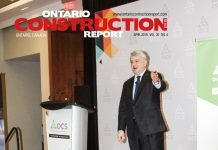 Ontario’s mechanical contractors have noticed a business slump as private sector funding has failed to compensate for the decline in the government-induced recession-fighting infrastructure funding surge. Coleman says the MCAO is working closely with IO to ensure local companies are not cut out through excessive project bundling. He said the government organization seems to be listening by helping educate smaller companies on how to get and stay involved. IO realizes the smaller companies of today are the bigger companies of tomorrow so ways must be found to support them, Coleman said. Rico Leone, president of the Mechanical Contractors Association of Niagara, agrees with the assessment, saying in the Niagara region, work volumes are down about 40 per cent from four years ago. Leone says they get the work done but end up being less efficient. Contractors are unable to pick up other projects because of the stacking of trades waiting to get onto a site and the labor crunch these timelines create. 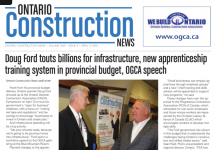 The Ontario College of Trades (OCOT) is creating other challenges. Coleman says while MCAO supports the OCOT in theory, there is concern that enforcing the letter of the law too stringently will chase business away from the province. Coleman says, with David Tsubouchi stepping in as new CEO, there is hope he will apply a refreshed outlook to the college and its approach. Coleman said the MCAO is working with the United Association of Journeymen and Apprentices of the Plumbing, Pipefitting and Sprinkler Fitting Industry of the United States and Canada (UA) ensure a smooth transition. He says the end result should be progressive and facilitate better working conditions. Safety continues to be a primary industry focus. The MCAO supports the Certificate of Recognition (CoR) as a safety credential, but he says the association doesn’t wish to see it as a prerequisite for tenders. Meanwhile, in November the MCAO met with other interested parties to explore re-establishing the Ontario Joint Standards Practice Committee, which has provided a forum for electrical, mechanical, general and steel contractors, plus architects, engineers and specifications writers, to achieve equitable solutions to problems facing various industry segments. Coleman says this is an area there has been a void and one that needs attention as the industry looks to move forward.